Picture a 19th century English country estate, complete with a residence surrounded by picturesque grounds extending as far as the eye can see in Sussex. Then picture a somewhat smaller country cottage amidst a modest estate in Devonshire. From there, envision lodgings near Portman Square in London, and finally a manor house in Somersetshire. These are the locations described in flowing detail in Jane Austen’s first published work, “Sense and Sensibility”. The adaptation for the stage by British playwrights Roger Parsley and Andy Graham is currently enjoying its American premiere at TheatreWorks. The famed Austen story follows the Dashwood sisters, Elinor (Jennifer Le Blanc) and Marianne (Katie Fabel), through a turbulent period following their father’s death. They are forced to leave Norland House, the home they’ve known for years, when their half brother and his wife take over the estate. With nowhere else to turn, they journey to Devonshire and take up residence in Barton Cottage, a smaller dwelling on the estate of their Aunt Jennings (Stacy Ross), who happily takes them in. Eligible young women, they cross paths with Colonel Brandon (Mark Anderson Phillips), John Willoughby (Michael Scott McLean), and Edward Ferrars (Thomas Gorrebeeck), each showing interest but each also possessing various character flaws, and in some cases significant strengths, which later become evident. Rounding out the principals, Elinor’s rival, Lucy Steele (Lucy Littlewood) also makes her presence known. When winter comes, they travel with their Aunt Jennings from Devonshire to London, and while in London, they learn some rather disturbing truths. The elder sister Elinor is the sensible one, experiencing life in practical terms, leading with her head. Marianne, on the other hand, leads with her sensibilities, experiencing life more completely through her emotions. As they discover some difficult facts about their beaus, they react as their personalities would dictate, but they also find comfort in trusting one another. Come spring, they journey to Cleveland Manor in Somersetshire and finally back to Barton Cottage, the story resolving in humorous, yet fitting fashion. Parsley and Graham’s adaptation keeps the Austen language style intact and retains a manageable principal cast of seven. While making a few characters introduced in the novel unseen and only referenced, others are combined into residual roles or are jettisoned entirely. The remaining three members of the cast of ten include the servants who also execute the scene changes. While the novel is rather ponderous in places, director Robert Kelley’s production is more up tempo overall and moves the story along most of the time though there are a few exceptions. As Marianne and Willoughby become acquainted and friendly, their “dramatic readings” and musical interlude are too expanded. The scene late in Act 1 at Barton Cottage between Elinor and Edward prior to Lucy’s arrival also drags, but these are really the exception. Le Blanc and Fabel work well together. Their sisterly conversations, even in the period lexicon, are natural and believable though Fabel’s overwrought emotions aren’t always quite on point. Ross’ Aunt Jennings is the stand-out performance of the piece. Her energy is contagious, and she adds excitement to every scene she’s in combining both the caring aunt with some flavor from Elinor and Marianne’s mother in this portrayal. She’s part busybody and part “parent” wearing her affection for her nieces on her sleeve. Gorrebeeck’s performance is delightful. He’s funny, appropriately awkward when his character should be stumbling about, and initially has good stage chemistry with Le Blanc, though both of them are at times a touch too forced in their vocal delivery. Phillips’ Colonel Brandon is a little dry initially. As his character develops he later warms up, though given Brandon’s age at “five and thirty”, his steadiness, and his quiet demeanor, he never reaches the energy the women foster in the play. McLean’s Willoughby embodies the male equivalent of Marianne’s sensibility early on with both of them boisterously embracing life head-on, albeit with a distinct lack of maturity. A slightly overused artistic flare in this production is the addition of songs from Jane Austen’s hand-copied manuscripts adding period music to the experience. Much of this music is used covering nicely choreographed scene changes, the servants movement to the music emphasizing the genteel nature of the surroundings, but in a few cases, the musical interludes outside of scene changes are a bit too extended. Most, however, add a pleasant texture to the performance. The cleverly staged madrigal showing dual romantic triangles, heralding their arrival in London, and forming an Entr’acte of sorts at the top of Act two is particularly well done. Joe Ragey’s scenic design captures the flow and artistry Kelley’s vision inspired. A bit surreal and abstract, he uses an oval upstage projection screen for scenic backgrounds behind physical accents of tree branches, picket fences, an outer door, period chairs, a working outdoor fountain and a rolled in piano-forte look alike. A particularly nice touch in the London scenes is the use of streetlights against the backdrop – lit at night, off during the day. At various points during the play, past events are described. They are simultaneously acted out in the upstage oval in front of the screen, clearly indicating the vision fitting the description. Fumiko Bielefeldt’s costumes capture the period beautifully, Elinor and Marianne wearing their own color schemes. Elinor is in more muted colors, Marianne’s are brighter and warmer. The Regency period costumes are built more for comfort, as Bielefeldt says, so they “look like the characters own them.” They are also creative in that Le Blanc and Fabel are rarely off stage, so full costume changes aren’t possible. They use creative accents to effect appropriate changes from outside to inside, and the decline of financial station, cleverly executing many of these changes on stage with servants attending their mistresses. TheatreWorks’ production of “Sense and Sensibility”, while somewhat understated, is an enjoyable evening’s entertainment and continues through 25 September at the Mountain View Center for the Performing Arts. 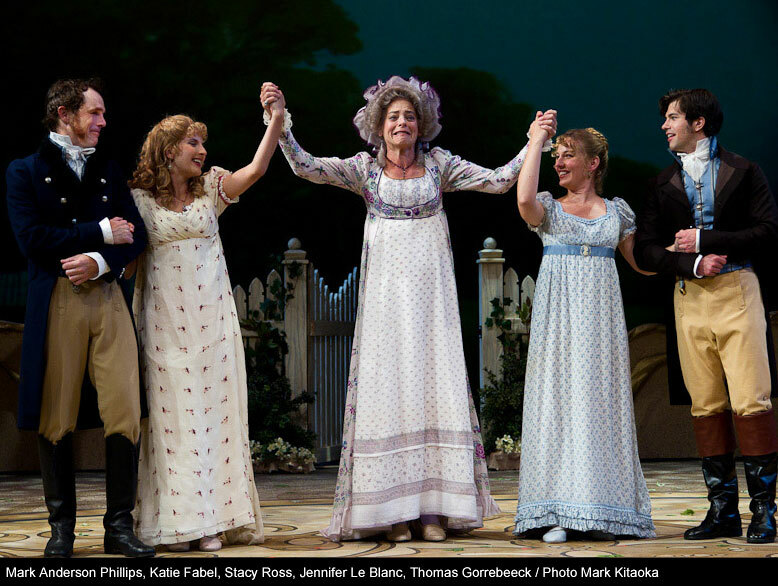 See http://www.theatreworks.org/shows/1112-season/senseandsensibility for more information.